Smooth flowing lines and sleek cornered angles create the frame of this large cocktail ottoman. 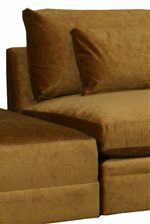 An upholstered modern furniture piece, this convenient item can be used for multiple purposes. Treat it as a footrest for resting weary feet, place a serving tray on it for a soft-topped cocktail table or place it next to a sectional component for an extended chaise seat. Complete with small wheel casters for easy movement around the room, this upholstered cocktail ottoman will create a modern accent to contemporary styled homes. The 1083 Large Cocktail Ottoman with Casters by McCreary Modern at AHFA in the area. Product availability may vary. Contact us for the most current availability on this product. The 1083 collection is a great option if you are looking for furniture in the area.